Gain a global experience without leaving the state of North Carolina! Link the Middle East and Islam to local realities! 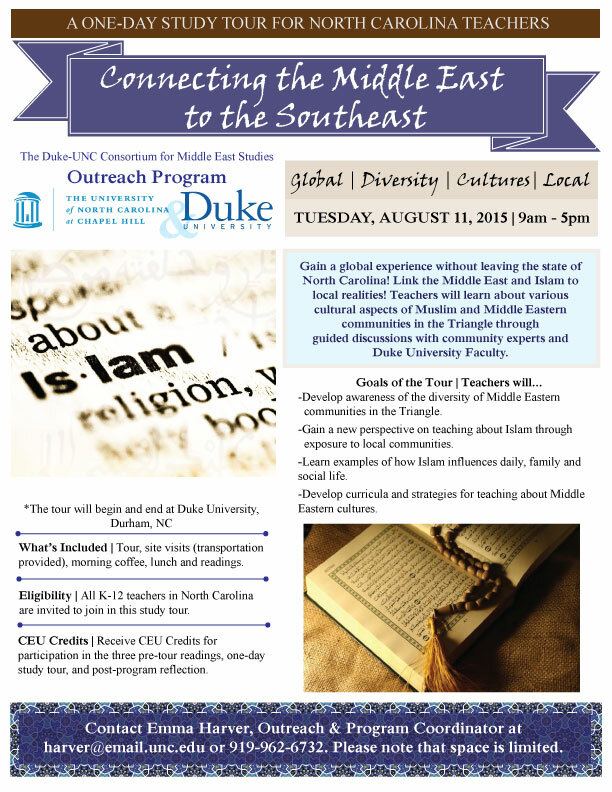 On this tour, teachers will learn about various cultural aspects of Muslim and Middle Eastern communities in the Triangle through guided discussions with community experts and Duke University Faculty. What’s Included | Tour, site visits (transportation provided), morning coffee, lunch, readings, and parking. Eligibility | All K-12 teachers in North Carolina are invited to join in this study tour. participation in the three pre-tour readings, one-day study tour, and post-program reflection. Please contact Emma Harver, Outreach & Program Coordinator at harver@email.unc.edu or 919-962-6732 for more details or to confirm your space in the tour. Please note that space is limited. Thank you to all of the teachers who participated in our pilot study tour on August 11, 2015! This tour was featured in the UNC University Gazette. Read about it here. 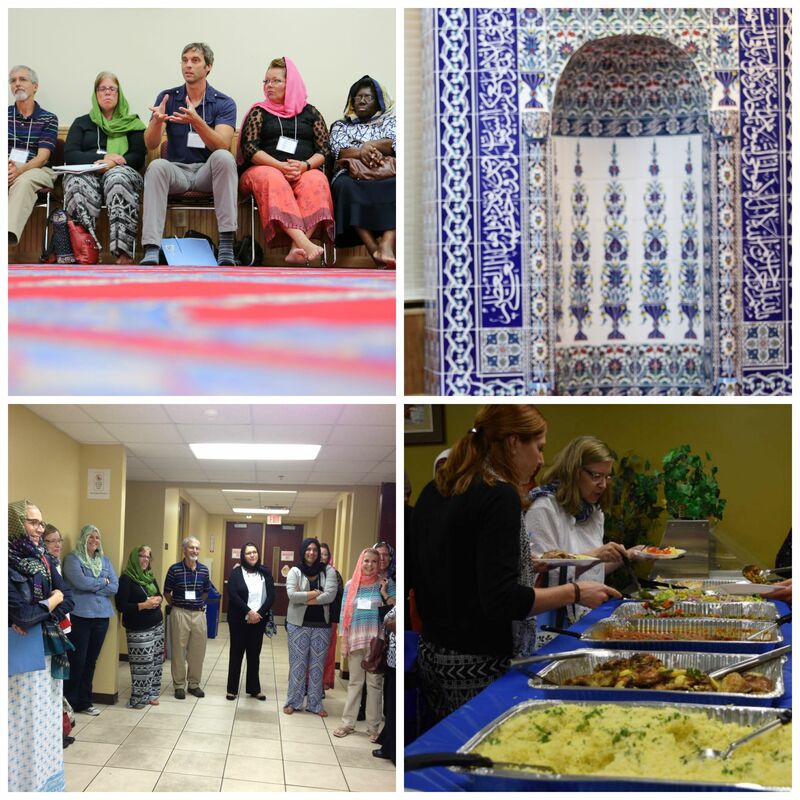 Top Left: Teachers engage with the speaker at the Institute for Islamic and Turkish Studies, credit: Brandon Bieltz, UNC-CH | Top Right: Tiled mihrab (prayer niche) at the IITS, credit: Brandon Bieltz, UNC-CH | Bottom Left: All smiles at the Islamic Center of Raleigh | Bottom Right: Teachers feast on Middle Eastern delicacies at the Islamic Center of Raleigh. First time visiting a mosque? Please read these FAQs by the Islamic Association of Raleigh. Islamic Association of Raleigh: The Islamic Association of Raleigh (IAR) is an Islamic center serving as a masjid (mosque), school, and a gathering place for the Muslim community in the Triangle region of North Carolina. Learn more about the activities and services that this mosque provides by clicking on their website. Al-Iman School: Al-Iman is an accredited, full-time Islamic school for Pre-K to the 8th grade. Institute of Islamic and Turkish Studies: This group is dedicated to addressing the religious, social and cultural needs of people living in North Carolina. They aim to be a resource on Turkish language and culture, support interfaith dialogue, and prevent misconceptions and misunderstandings about Islam and Muslims. Gani, Aisha. (2015, June 17). Ramadan: a guide to the Islamic holy month. The Guardian. Retrieved from http://www.theguardian.com/world/2015/jun/17/ramadan-guide-to-islamic-holy-month-muslims-fast. Obama, Barack. (2015, June 22). Remarks by the President at the 2015 Iftar Dinner. Speech presented at the White House, East Room, Washington. D.C. Retrieved from https://www.whitehouse.gov/the-press-office/2015/06/23/remarks-president-2015-iftar-dinner. Beydoun, Khaled A. (2014, June 28). 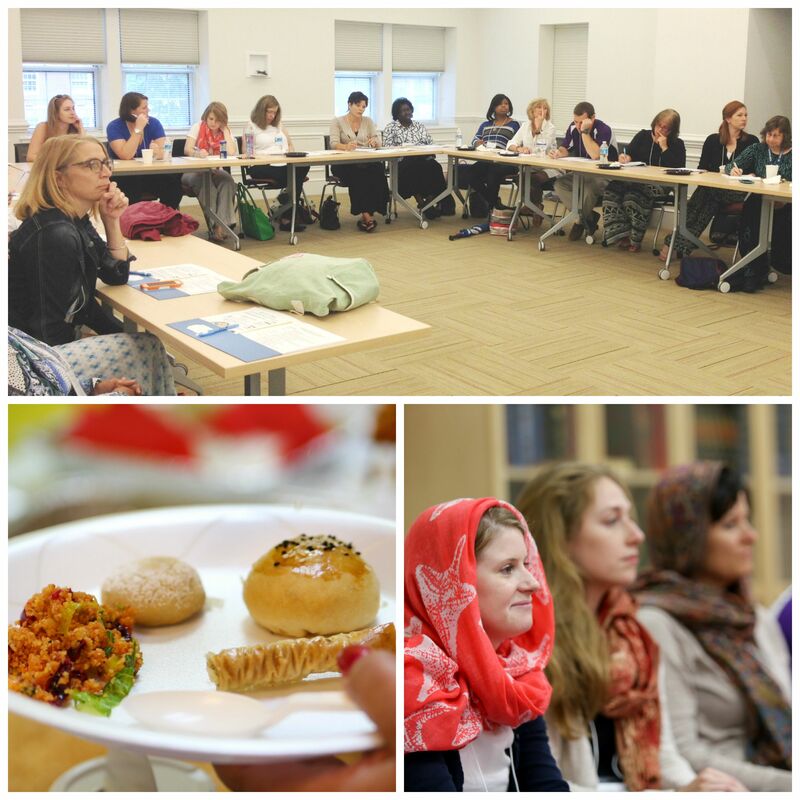 Ramadan: A centuries-old American tradition. Al Jazeera. Retrieved from http://www.aljazeera.com/indepth/opinion/2014/06/ramadan-american-tradition-201462714534443176.html. Prince Among Slaves: the Cultural Legacy of Enslaved Africans. Unity Productions Foundation and PBS. http://princeamongslaves.org/. Hammer, Julianne and Safi, Omid. (2013). Introduction: American Islam, Muslim Americans, and the American Experiment. In Julianne Hammer & Omid Safi (Eds. ), The Cambridge Companion to American Islam (1-14). New York: Cambridge University Press. First Amendment Center: FAQ’s about religion in schools. http://www.newseuminstitute.org/religion/resources/qa/. Howell, Sally. (2013). Laying the Groundwork for American Muslim Histories: 1865-1965. In Julianne Hammer & Omid Safi (Eds. ), The Cambridge Companion to American Islam (45-64). New York: Cambridge University Press. Abdullah, Zain. (2013). American Muslims in the Contemporary World: 1965 to the Present. In Julianne Hammer & Omid Safi (Eds. ), The Cambridge Companion to American Islam (65-81). New York: Cambridge University Press. Khater, Akram. (Executive Producer). (2012, November 8). Cedars in the Pines [Television broadcast on UNC-TV]. In Cullinan, Diana (Producer.) Research Triangle Park, North Carolina: UNC-TV. Retrieved from: http://video.unctv.org/video/2303678785/. Ernst, Carl. (2003). Approaching Islam in terms of Religion. In Following Muhammad: Rethinking Islam in the Contemporary World (62-69). Chapel Hill: The University of North Carolina Press. Drake, Todd. Esse Quam Videri: Muslim Self Portraits. Available at http://www.muslimselfportrait.info/.